It’s no mystery to anyone in my inner sphere that I live a vividly colorful emotional life! And if you don’t know me personally, you probably get a good sense of that in this blog. I am of the deeply-seated belief that our hearts and their expression is of the utmost importance – right after embracing the stillness just underneath it all (a good Buddhist throw-in, there). Today’s not been an easy day for my heart. But always there is hope. Indeed, hope springs eternal. How glad am I that I’ve been reminded of the power of hope so much these past months by the Obama Campaign. Hope is not folly, he says. Indeed. Hope lives in the swinging of the Hanged Man. I consult the tarot from time to time. Lately, in a swath of confusion and fear, I’ve thrown the cards a bit more often than usual. I like to take it all with a grain of salt, glean what extra resolve or caution I can, and rest assured that my open heart is the best defense against complete misery, no matter what the cards reveal. And I’ve so rarely shared any news slipped me by the cards. I thought I’d go ahead and change that today. As for the whole spread, that’s mine to ruminate in. But there were three choice cards I’ll share a little about. First and foremost, and most beautiful was the Hanged Man. 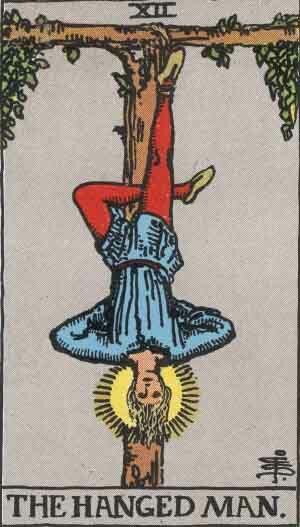 The Hanged Man appeared at the end of the spread (the layout of all the cards – I use the classic Celtic Cross Spread), in the “outcome” position. The “outcome” of the situation as indicated in this card can be tempered or magnified by the energies in other cards around it, and I’ll suffice it to say that they magnified it for the positive. This, understand is quite subjective and given the other cards I saw around this, it is a positive one. I understand this card, in general, to point most towards the need to look deeper, look under the emotions and realize that all is changing for the better. Perhaps, it is always changing for the better as forces at play and the choices we make in our own lives, I believe, simply lead to the next needed thing to fit the next opening and spiritual availability. For me, this is a very good “outcome” card, if only for the reminder of that deeper truth. The Star is the second most important card to me today because it is so hopeful and appears in the spreading in the position of “to come”. This represents what is to come, along with the tenth and final “outcome” card, dealing with future circumstances based on actions set in motion now and in the past. 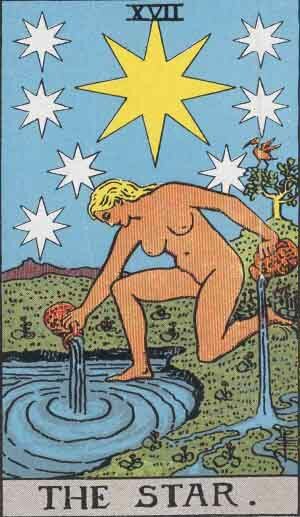 I find this card, portraying the water bearer, particularly personal due to it’s connection to Aquarius, my sun sign, though the card itself is ruled by Gemini. The Ace of Cups, the other future-oriented card in my spread today has obvious positivity as it’s painting depicts an over-flowing challis. Sitting in the “crowing” position, this card represents with could come into being, something that has not yet materialized. It speaks to a possible – often probable – turn of events. Since my confusion lately has to do with having no anchored sense of what my future holds, I am happy to see this card turn up. Again, I know that the energies the cards express must only serve to help me keep an open and available heart, but hope is a fire that often needs stoking. 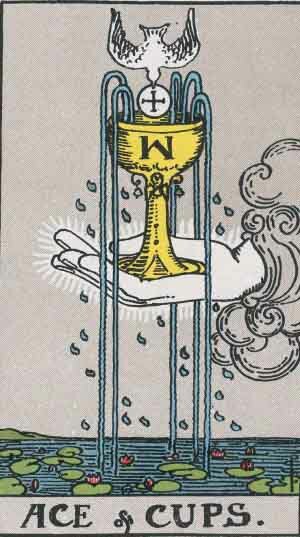 The Ace of Cups expresses the “beginning of all good things: love, joy, health,” as Connolly says, “Joy within the home and heart, blessings come with this new start.” It speaks of the development of new spiritual insight and sensitivity, activities regarding present home or a new home, changes in affairs that affect the home which will result in happiness for all concerned, and the start of a love affair.” All in all, a very pretty pretty card to get. I am taking the whole situation in stride as best I can, the cause for the questioning, as well as the turmoil of the questioning, and the answers sent for the questions from the human, super-human, and otherworldly realms. I like to think that no matter whether these cards are truly answering the question I specifically ask about, or are just giving me a stronger sense of things afoot in general, that the guidance I take is applicable to all if held in the light of beauty and held atop that deep sense of stillness under my emotions. So far, so good if even so far, so difficult. What an intense and beautiful life. ~ by HeatherArtLife on November 10, 2008. I have heard it said that the hanged man represents the tragedy of imagining that one’s life is perfect when in fact it is a disaster. “Hope springs eternal” might mean that one forever imagines a situatuation different from the current one and may thereby spend an entire lifetime in anticipation instead of sinking deeper into this moment. To me the cards remind me that the situation is grim but that it might be transformed into something of great value with the help of divine intervention. We are all pretty much in the same situation. I should add that I have not studied the cards.